on-trend indoor plants delivered to your door, and a sophisticated alternative to sending flowers. Geometric concrete planter paired with the delightful Good Luck Cactus (A.K.A the Friendship Plant, the African Milk Tree, or plain ol' Euphorbia Trigona). The deep, dark green of the Peperomia or Baby Rubber plant is elegant yet striking in this dappled gold planter. Complete with river stones, this indoor beauty is a classic that's sure to please even the most refined palettes. A beautiful mix of vibrant succulents, in a dappled white ceramic planter. Perfect anywhere. This gorgeous burgundy and dark green baby rubber is a stand out performer. Arranged in a modern geometric white planter, this stunning combination makes an ideal gift. A perfect Peperomia matched with an elegant dappled white planter. Exquisite, divine and low maintenance. Sweet dreams are made of this. A delicious mix of succulents, paired perfectly with a rose gold planter. This modern cement and gold planter comes paired with a blue-green cactus, nestled amongst pale stones. The ultimate low-maintenance plant that will look good just about anywhere. Grab one for yourself and one for a friend and be cacti buddies forever. Beautiful Jade is often known as the friendship tree, lucky plant, or money tree. 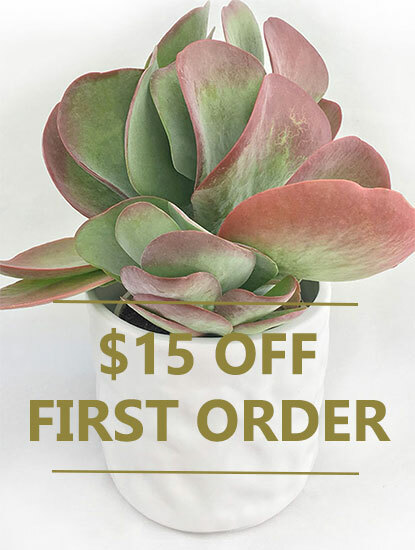 Considered extra lucky when given a gift, this super low maintenance succulent is sure to delight. Available in a geometric black or geometric white planter.